Margaret Rose Kane was thoroughly annoyed when she discovers that her parents are not going to take her with them to Peru. To make matters worse, her much loved uncles, Morris and Alex Rose, do not offer to let her stay with them. Instead, they recommend that she spend the summer in a camp. Still feeling hurt by these rejections, Margaret Rose thoroughly researches the camps in the area and she chooses Camp Talequa. Unfortunately, Camp Talequa does not turn out to be the inviting and friendly place she thought it would be. Instead, the counselors keep trying to make Margaret join in activities that she does not care for. She tells them "I prefer not to" which quite shocks them. Why would a child not want to join in? Then Margaret's cabin mates begin to bully her because she refuses to play by their rules too. All in all Camp Talequa turns out to be a frightful place for an independent soul like Margaret. Thankfully, the camp director decides to call Margaret's uncles to talk to them about her willfulness. As a result Uncle Alex comes to the camp, and without further ado, he removes his niece from it. He manages to bully the camp director to arrange a ride for himself, Margaret, and his dog Tartufo. The person who drives them turns out to be the handyman, who they discover is the camp director's son, Jake. Jake gets along with Margaret and Uncle Alex so well that he ends up driving them all the way home. When they get to the uncle's house Jake sees two enormous towers in their garden. The brothers built the towers themselves and they are quite spectacular. Jake falls in love with them at once. He offers to paint a rose on Margaret's bedroom ceiling, something he is very qualified to do since he used to be a sign painter. Margaret is delighted to be back in her uncle's home, but she is not back long before she develops the feeling that something is amiss. Quite by chance she learns that the towers in her uncle's garden are going to be torn down. Some time ago the local Home Owners Association decided that the towers affect their property value, so they made a complaint saying that the towers are unsafe. For three years Margaret's uncles fought to save their creations. They lost the battle and now the city is going to demolish the towers which Margaret, her uncles, and many other people love so much. Margaret is determined to do something about the situation. She is very angry about the actions of the city and the Association, and she is very motivated to save the towers. Now all she needs to do to bring about change is to develop a plan. Is there someone out there who can help her? 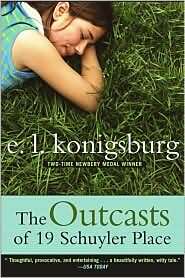 In this unique novel E.L. Konigsburg shows her readers that people can indeed bring about change if they work together, if their use their creativity, and if they believe in their cause hard enough. Margaret may only be a young girl but she has plenty of courage and the imagination to see beyond the ordinary. Packed with deliciously colorful characters and written using a distinctive format, this is a book that readers will find irresistible once they have read the first page or two.